When you hear New Orleans, what comes to mind? Mardi Gras and Bourbon Street, right? Even today, we tend to think of New Orleans as a city that's more than a little naughty, a boozy, raucous red light district of a city. Of course, there was once an actual red light district there and although it didn't last long, it has left a permanent stamp on this city of masquerades and reinvention. 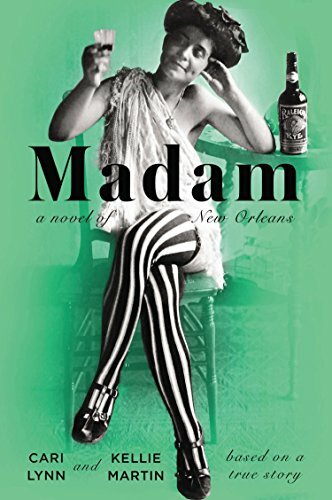 Cari Lynn and Kellie Martin have chosen to write a novel, based on a true story, about the creation of Storyville, that storied red light district and one madam who started with nothing and rose to the pinnacle of her profession in Madam: A Novel of New Orleans. In the late 1890s, New Orleans was rife with crime and vice. One city alderman, Alderman Sidney Story, wanted to restrict the city's prostitutes to one district, keeping them out of sight of the other good citizens of the city. His goal would eventually lead to the creation of The District, nicknamed Storyville after the crusading alderman and much to his chagrin. But the pious Story didn't know much of the women, the pimps, and the criminals who made up the population he wanted to hide away from view. In fact, he seemed unable to acknowledge the extent to which the "good" people of the city, including the politicians and the justices who were supposed to serve New Orleans, were in bed, literally and figuratively, with the unsavory side. Mary Deubler, one of the women Story would never have occasion to know, was one of the alley whores whose livelihood depended on the lax enforcement of the laws against prostitution. Born to a mother who was also a prostitute and who died when Mary was still quite young, Mary is pimped out herself at only 12 years old. Prostitution is Mary, her brother, and her brother's young, pregnant wife's main means of support. She is intelligent (she can read) and wily enough to try and better her situation when a chance comes her way but the poverty and conditions in which she plies her trade are inescapable until she comes to the attention of the kingpin of the New Orleans underworld, a man who will assist her in her transformation into Josie Arlington, exclusive madam. The main narrative is framed by apologetic letters from her niece to a now deceased Josie/Mary. Both of the letters are dated from the same time period and they essentially say the same thing, giving the novel a strange repetitive circularity. After the introduction of the first letter, the novel jumps in time to 1907, when Mary, as Josie, was clearly in her prime and wildly successful. She's drawn as melancholy and lonely as she avoids a celebration of her birthday for reasons that never do become clear in the novel. This brief glimpse of her as a successful madam is short-lived though and the bulk of the story takes place a good ten years prior, when Mary is no more than an unremarkable alley whore trying to make enough money to feed her family. Mary's an interesting character, alternately jaded and naive, and she will be raised through the agency of someone else rather than by her own strength. Unfortunately, why she above any others would have been singled out remains a question throughout the novel. The legal and political machinations behind the creation of Storyville are interesting to read and Mary's hard early life is fleshed out quite convincingly but there is nothing beyond her meteoric rise besides that small glimpse at the beginning of the novel. Lynn and Martin sprinkle historic characters throughout the novel as they allude to the birth of jazz, the uneasiness of race relations in the district, and the disenfranchised who people Mary's world. There is a surprising lack of place here, especially given how unique New Orleans has always been, descriptions of the underworld are often times glamorized, and the whole thing feels sanitized somehow, even if the main character is a prostitute. Hints of voodoo weave through an otherwise fairly straightforward story, presaging some of the eventual action. The writing is sometimes clunky and awkward, especially at the beginning, the missing chunks of time in the narrative are frustrating, and none of the characters besides Mary/Josie are fully realized. Despite the problems with the novel, this manages to be a quick and colorful read. Lynn and Martin do do a good job showing that the political wranglings affected those without a voice and without any other means of support and that the women of Storyville were just trying to make a living the best and only way they could. People who enjoy tales of New Orleans, those who like rags to riches stories, and those who have a bit of a prurient interest in the underside of history might find this worthwhile in spite of its flaws.